TOKYO (AFP) - The highly ceremonial and ordered world of sumo was rocked Tuesday (Nov 14) as allegations emerged that one of the sport's worshipped grand champions smashed a beer bottle over a fellow wrestler's head. Mongolian "yokozuna", or grand champion, Harumafuji issued an apology before the Japanese media, as officials said they were probing the incident that has led to his absence from an ongoing tournament. The 33-year-old Harumafuji hit his countryman Takanoiwa, 27, last month when Mongolian wrestlers gathered over drinks after the autumn tournament, several media reported. "I deeply apologise over Takanoiwa's injury," Harumafuji - one of three reigning Mongolian yokozuna - told reporters at his training site in the western Japanese city of Dazaifu. But he deflected further questions to the "stable master" who runs the camp. The ancient sport has an extremely strict protocol, and yokozuna are expected to be beyond moral reproach in addition to showing superior strength and technique in the ring. Wrestlers are not even allowed to express emotions when they win as this is seen as inconsiderate to the loser. Tomokatsu Taniguchi, head of legal affairs for the sumo association, told AFP that Takanoiwa's stable master had submitted a doctor's certificate regarding a head injury that would require two weeks to heal. A link between the injury and the allegation is not confirmed, added Taniguchi, as officials are still investigating the matter. 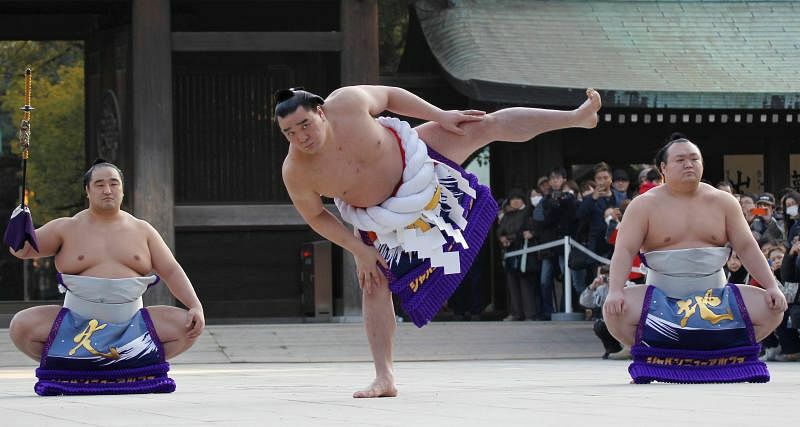 Harumafuji is viewed as having a skillful technique that allows him to offset a relatively small body weight - at a mere 137 kilogrammes, he is one of the lightest in the sport's top division. He emerged victorious at the most recent tournament in September in Tokyo, edging out Japan's Goeido in a thrilling last day bout. "Harumafuji will be absent from the third day" of the current tournament in Fukuoka, western Japan, the sumo association tweeted without giving a reason. Tales of extreme physical abuse are becoming more common in sumo - Japan's national sport - which is characterised by harsh training and strict hierarchy. It has also been hit in recent years by bout-fixing rumours and illegal gambling. Last year, a wrestler and his stable master were reportedly ordered to pay more than $287,000 to a fellow grappler for daily abuse that led to the loss of sight in one of the victim's eyes. In 2007, a trainee sumo wrestler died after being bullied and subjected to violent initiation rites, sending shockwaves through the sport. A stable master who struck the teen with a beer bottle was sentenced to five years in jail for negligence resulting in death. And in 2010, firebrand Mongolian grand champion Asashoryu retired after being accused of breaking a man's nose in a drunken brawl outside a Tokyo nightclub. Violent treatment of apprentices and junior wrestlers in the name of training had long been seen as par for the course at sumo stables, but the sport is now struggling to oust such customs. Another Mongolian grand champion Hakuho, seen as a gentle giant, has almost single-handedly restored the sport's good name. But he too fanned the flames of a row over sumo etiquette in 2015 when he was annoyed at being ordered to repeat a bout deemed too close to call, letting rip at the decision.